I thought I'd take camera in hand this morning while I strolled the garden. It has been raining for a few days and things are quite soggy out there. So an inspection was needed. The raised beds are doing fairly well. The odd looking things at the base of the willow teepee are sheets of hardwire cloth. I have to put them down to keep the squirrels from digging up the seeds at the base of the teepee. This is now my second set of seeds to plant there this spring, the first set having been eaten by the devils! 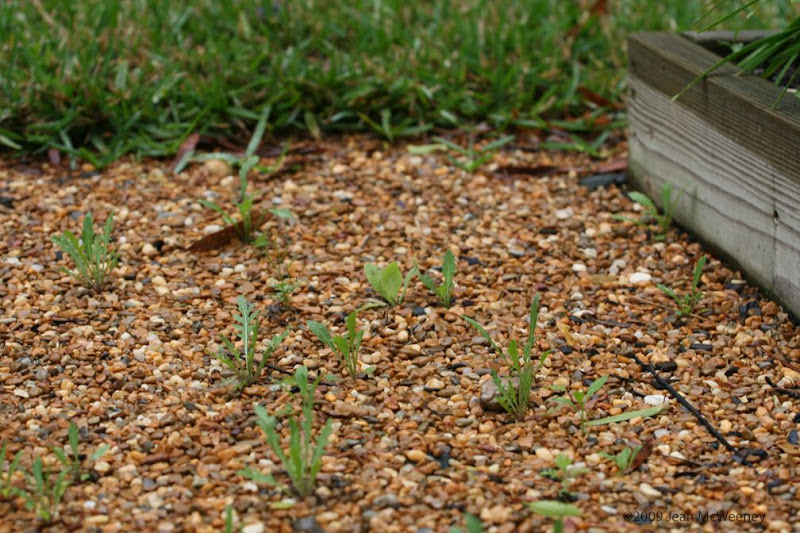 These little seedlings, at least most of them, are freebies from the wild Italian arugula I grow. I haven't figured out what to do with them all in the gravel path. But whenever I'm walking through there I get hungry for arugula because of the smell from squashing them! Ah, a pretty little nicotiana. This particular plant survived the winter. The 'Fireworks' clematis on our Egyptian gate trellis. I couldn't resist another shot of the irises in bloom. The 'Carnaby' clematis is getting lost in a sea of Madame Alfred Carriere petals. 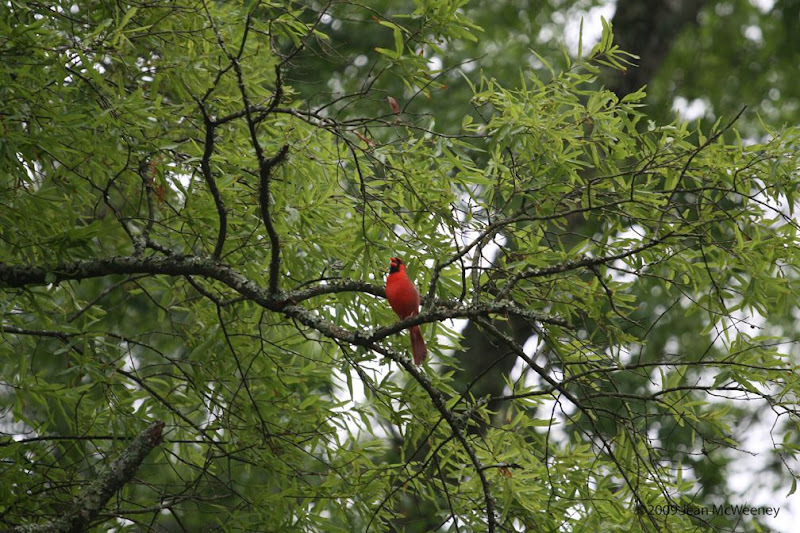 And this little cardinal was singing madly as I strolled. 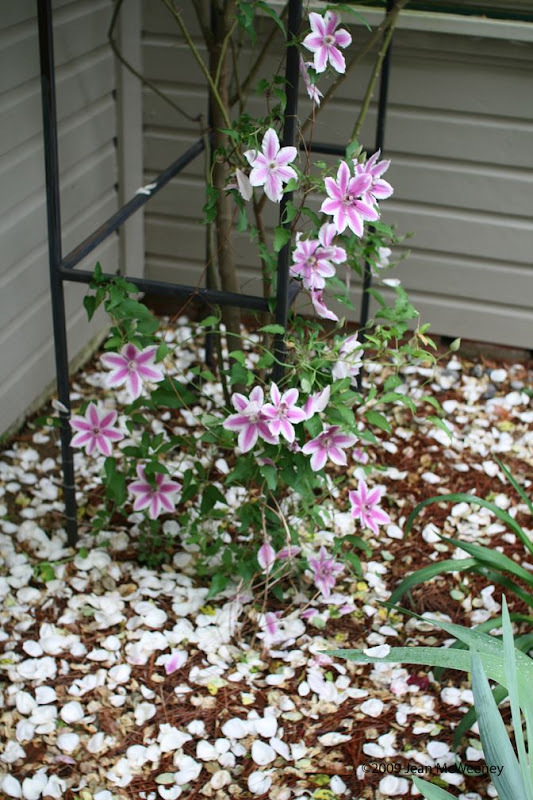 I love the picture of the clematis, makes me wistful for summer here. Also the bird - how pretty! Thanks for the tip about the himalayan poppy - if it will grow in Ireland, chances are it will be fine here. Enjoy your Sunday (mine's nearly over!) and put your tired feet up! 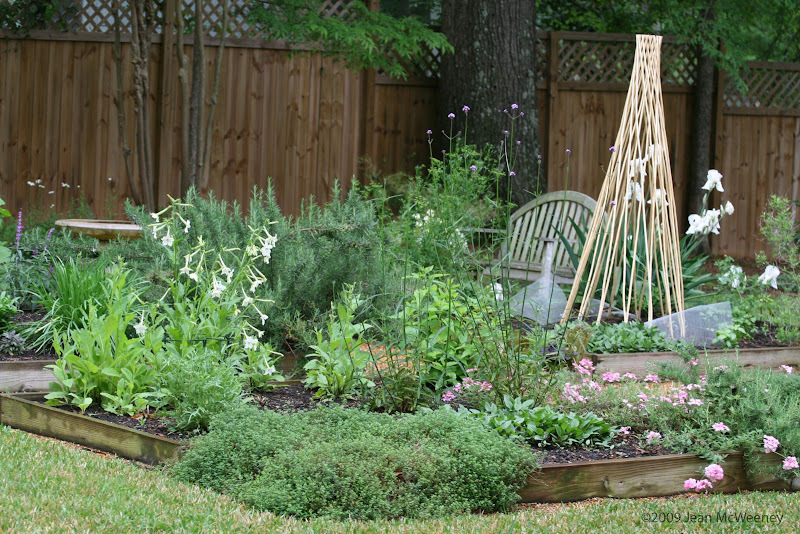 Your garden has such imagination and is filled with such pretty things to look at. 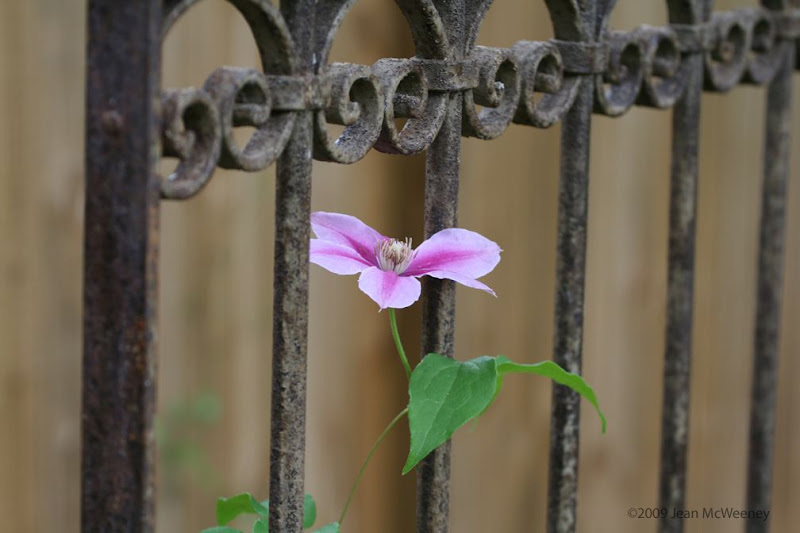 I like your clematis shot on the gate trellis. Wow! Love the clematis within the seemingly old trellis... poetic...also above the petals and I can just hear the song of the cardinal. Lovely. 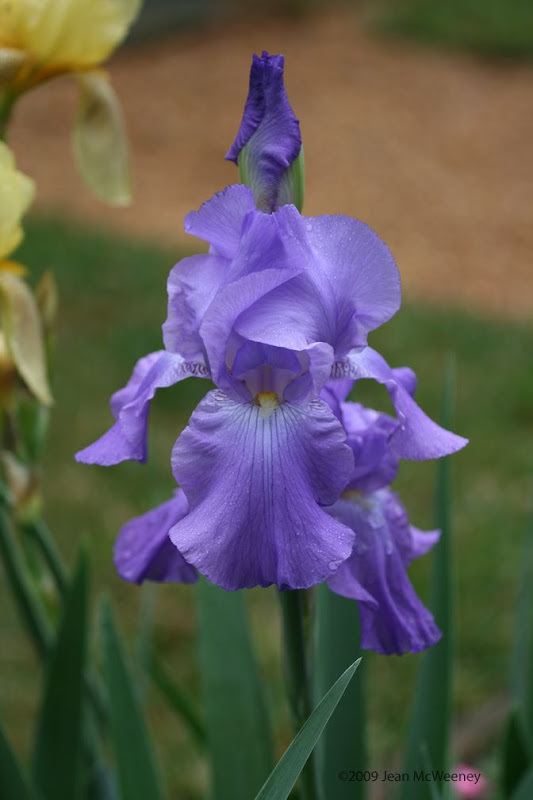 Oh Jean, I love the iris and raised beds. But those devil squirrels, arghhh! Don't you hate having to put wire and sticks, etc. for protection? Sometimes they even find a way around it anyway. Very nice photos! 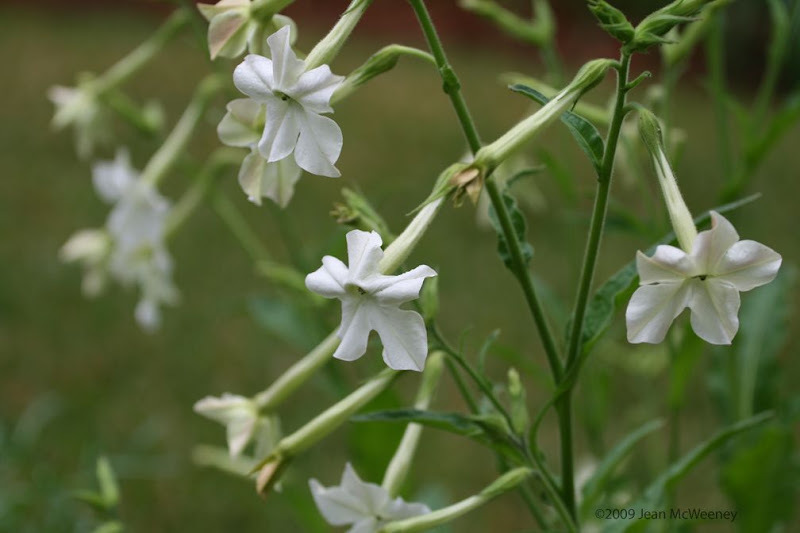 I especially like that sweet little Nicotiana. You're so lucky to have the rain, we are in the third year of drought and things are very dry already.